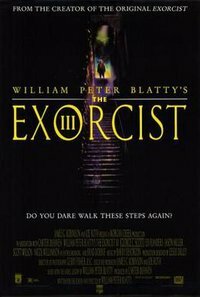 The Exorcist III is a 1990 American psychological horror film written and directed by William Peter Blatty. It is the third installment in the Exorcist franchise and an adaptation of Blatty's Exorcist novel Legion (1983). It stars George C. Scott, Ed Flanders, Jason Miller, Scott Wilson and Brad Dourif. The Exorcist III is set 17 years after the original film and ignores the events of Exorcist II: The Heretic. It follows a character from the first film, Lieutenant William F. Kinderman, who investigates a series of satanic murders in Georgetown that have the hallmarks of the Gemini, a deceased serial killer. Blatty based aspects of the Gemini Killer on the real-life Zodiac Killer, one of several serial killers who enjoyed the original Exorcist. This webpage uses material from the Wikipedia article "The_Exorcist_III" and is licensed under the GNU Free Documentation License. Reality TV World is not responsible for any errors or omissions the Wikipedia article may contain.